Brief History of Oxford | Oxford Maryland Vacations! Oxford is one of the oldest towns in Maryland and is listed on the National Registry of Historic Places. Although in existence for perhaps 20 years, Oxford marks the year 1683 as its official founding, for in that year, Oxford was first named by the Maryland General Assemble as a seaport and was laid out as a town. In 1694, Oxford and a new town called Anne Arundel (now Annapolis) were selected as the o nly ports of entry for the entire Maryland province. Until the American Revolution, Oxford enjoyed prominence as an international shipping center surrounded by wealthy tobacco plantations. Early citizens included Robert Morris, Sr., agent for a Liverpool shipping firm who greatly influenced the town’s growth; his son Robert Morris, Jr., known as the “financier of the Revolution,’ Jeremiah Banning, sea captain, war hero, and stateman; the Reverend Thomas Bacon, Anglican Clergyman who wrote the first compilation of the laws of Maryland,; Matthew Tilghman, known as the ‘Patriarch of Maryland’ and ‘Father of Statehood’ and Colonel Tench Tilghman, aide-de-camp to George Washington and the man who carried the message of Cornwallis’ surrender to the Continental Congress in Philadelphia. The American Revolution marked the end of Oxford’s glory. Gone were the British ships with their variety of imported goods , and tobacco was replaced by wheat as a cash crop. Businesses went bankrupt, cattle grazed in the streets, and the population dwindled. After the Civil War, Oxford emerged from its ‘long slumber’ to nearly 100 years of a new prosperity signaled by completion of the railroad in 1871 and improved methods of canning and packing which opened national markets for oysters from the Chesapeake’s bountiful beds. Business boomed, houses went up everywhere, and tourists and boaters arrived in droves. But it was not to last…. In the early part of the 20th century, the oyster beds played out, the packing houses closed, businesses again went bankrupt, and the railway and steamships disappeared. 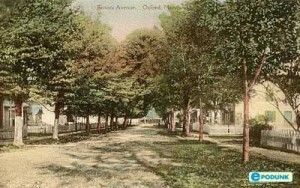 Oxford became a sleepy little town, inhabited mainly by watermen who still work the waters of the Tred Avon River. Today you will find that Oxford is still a waterman’s town, but enjoys a new resurgence based on tourism and leisure activities. Its quiet charm, fresh air, summer breezes, and clean water provide a haven from the hustle and bustle of city life for boaters, weekend visitors, and summer residents.